I love mangoes and I love guacamole...who would of thought of combining the two together to make the perfect appetizer for dipping? Well, someone did! Check out this recipe courtesy of IMUSA. I am definitely going to try this one!!! You can find that adorable serving bowl on the IMUSA site too! Everyone loves snacking on chips and dip at a party, so why not spice up your dip with this delicious recipe for Mango Guacamole courtesy of IMUSA, and give guests a real treat. This tasty side dish can be whipped up in less than five minutes, so no need to be stuck in the kitchen all day preparing. This guacamole is filled with incredible flavors & the mangos offer the perfect complement to the avocados - so serve it up at your next party and no one will be able to resist! 1.In your IMUSA Molcajete, add half of the diced mangos and mash with the pestle from the IMUSA Lava Rock Molcajete, into a pulp. 2.Then add one avocado and mash into a pulp with the mango. 3.In a separate bowl mix remaining ingredients, including mango and add more lime juice if needed. 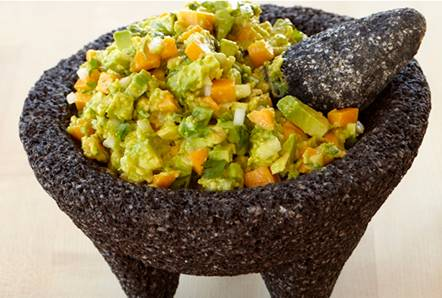 4.Fold mixture with pulp inside Molcajete and serve with tortilla chips.